Churn is a fire alarm. It's a great indicator that something's gone wrong, but it doesn't help you put out the fire. In order to diagnose and fix your customer retention problem, you need to look deeper than the simple churn formula of customers out versus customers in. You need to get an understanding of the customer retention metrics that tell you who is churning, when they're churning, and why. Only then will you be able to use your time wisely, and make adjustments that will have the biggest impact on the growth of your business. Here's how to find the source of that fire, and put it out before your company burns down. No one's denying that great acquisition is instrumental to the early success of a company. But you can't let your success in acquisition mask a churn problem. Here's an example from Profitwell for what that means in the real world. 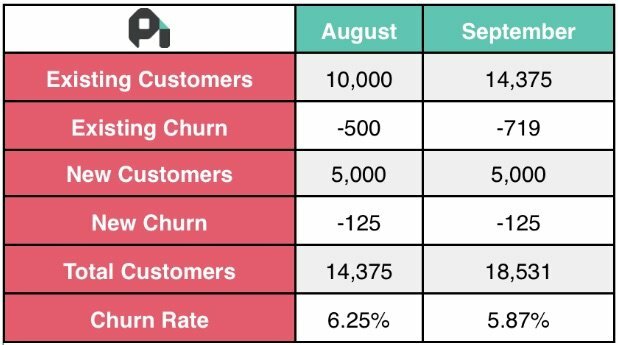 The problem with that churn equation is that the exact same behavior (adding 5,000 users) doesn't yield the same result—the churn rate for September is lower than that of August. Rapid growth artificially decreases churn since all the new customers added each month haven't yet had time to cancel. Since a few percentage points of churn can mean up to a 25% increase in revenue down the line, you don't want any inaccuracies. A great churn number skewed by growth isn't going to accurately tell you when something has gone right or wrong. That's why Shopify has come up with an adjusted formula for startups that are growing fast. Yes, we know that looks scary. So let's break it down. If the users were added to the customer base gradually, then the average will increase, and it will affect your monthly churn number more. If the users were added to the customer base near the end, it wouldn't skew your churn number to give you the impression that it's lower than it really is. Basically, all this means is that you're balancing out your acquisition with the average. Big spikes in growth won't distort your number or mislead you into thinking you outperformed one month, and then underperformed the next. If there's any red flag that's even worse than churn, it's inconsistency. If you can't get your retention curve to flatten, then your product has no traction. So let's say that 100 users who start on January 1st, have a 40% retention rate by the end of the month—but the group hasn't yet stopped churning. It's still continually shrinking after the month ends, and by the end of the second month, nothing will be left. 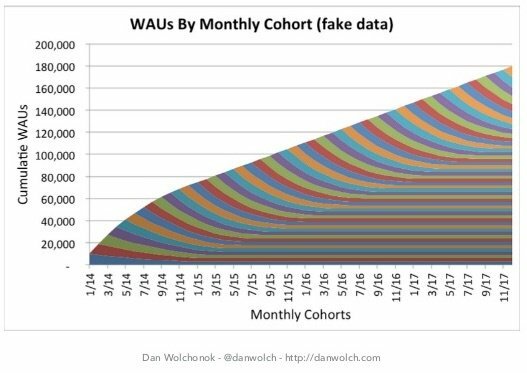 If you have cohorts—users grouped by subscription dates—that are dwindling away into nothing and never leveling off, you have a huge problem. Here's what it means for your growth. It won't slow your growth much at first. But, looking at the graph above, ultimately the amount of users that are churning adds up over time and slows your growth. In the months to the right of that graph, the curve would eventually fall off. Users are leaving the app at a higher and higher rate, while you're acquiring at the same pace. 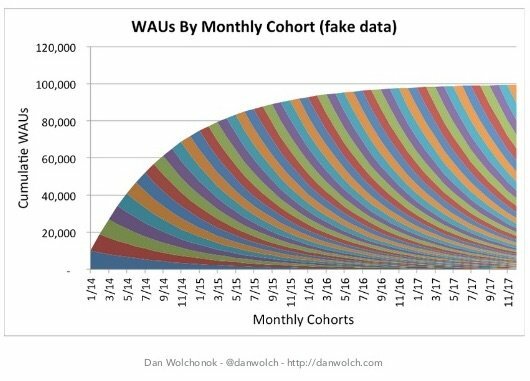 Separate users based on start date and perform a cohort analysis. 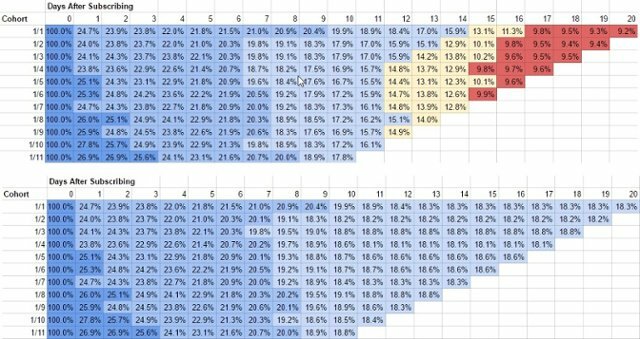 What you want to look for is a flattening of the retention curve, or, that point in time in the cohort—whether it's day 2 or week 3—where users stop churning. Take a look at these two cohort analyses. In the first, each cohort is slowly churning until there's nothing left. 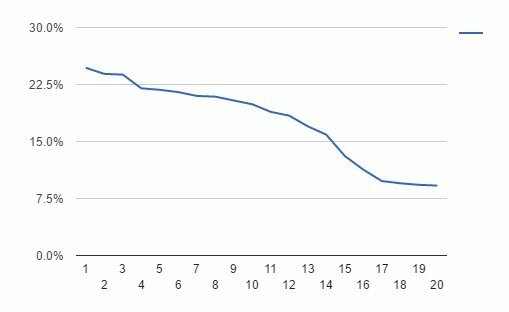 But in the second, the retention curve flattens around Day 12, so that each new cohort builds on what's left of the previous one. If your analysis looks like the first, you have to focus on providing value to your users during onboarding and the early stages of retention. If you've been able to achieve a flat retention curve, you can put your effort into getting it flatter soon. Try to guide users to an Aha! moment on day three, rather than day 12, when the same retention rate amounts to more users. How valuable are your users? Even if we are able to flatten that retention curve, some users are still going to fall off sooner or later. The goal is to decide how soon is too soon, and what we can do to keep them longer. Legend has it that as long as the Lifetime Value of a Customer (LTV) is higher than the Customer Acquisition Cost (CAC), then you're solid. Basically, as long as you spend less on marketing than your overall revenue from those acquired users, you're doing well. As we showed in the previous section, churn rate isn't constant, nor do we want it to be. We work to constantly improve it. In regards to 2, we hope to have customers that never churn (Gmail and Netflix sure do!). Instead, Open View Partners have come up with a better formula to understand the value of your users. They recommend looking at something called Cumulative Cohort Revenue (CCR) and comparing that against the CAC. The CCR is the total amount of revenue you made from a chunk of customers acquired within a certain time period (usually 12 or 24 months). You'll notice that the above formula includes a span of time. This formula ensures that you're comparing the actual total revenue of any given cohort against the amount of money you spent to acquire them. No false assumptions for this one, and it gives clear insight into where you break even with your CAC. 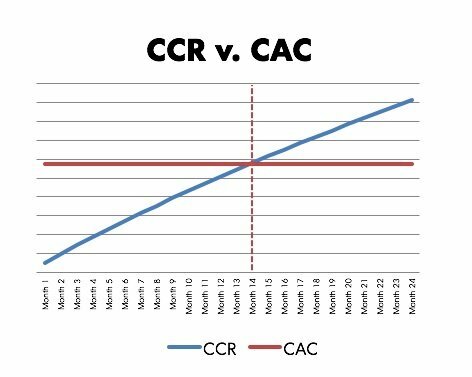 Comparing your CCR v. CAC across different cohorts will show you whether you're improving over time and how quickly you can recoup the amount of money you spend acquiring customers. Which users are on the brink of churn? Your user retention numbers are helpful, but they don't tell the whole story. Thing is, a user might churn a minute, an hour, or even a week after they've made their mind up about your product. Maybe they keep meaning to cancel, but forget. Or maybe they keep thinking they'll give it one more shot, but never get around to it. So let's say your customer retention graph has this concerning slope to it. You might see that retention is plummeting but have no idea where things are going wrong. It looks like the curve steepens on day 14—but is that because something goes terribly wrong on day 14 or is that just when they remember to cancel? Instead of looking at just retention, you should be looking at behavioral analytics. This will give you a sense of who's active and who just hasn't gotten around to unsubscribing. If your product core value hinges on daily use (a messaging app, a workflow organizer, etc), then you have to look at daily activity numbers. If, however, your product's core value hinges on infrequent check-ins, keep track of the WAU or even the MAU. Users don't just wake up one day and decide to leave your app. Churn is usually preceded by a decline in activity. Set activity benchmarks for your users, and if they don't reach them, start re--engaging before it's too late. It's tempting to blindly apply any and all retention strategies to your user base—whether you have a churn problem or not. But this will result in you spreading yourself thin and achieving very little. These 4 metrics equip you with the insights necessary to pinpoint your churn problem, in order to make the most impact ASAP. And once these four metrics show you great results, you can buckle down and start focusing on getting even more value out of those users.